Pope Paul V (Latin: Paulus V; 17 September 1550 – 28 January 1621), born Camillo Borghese, was Pope from 16 May 1605 to his death in 1621. He is best remembered today as the Pope who persecuted Galileo Galilei. Camillo Borghese was born on 17 September 1550 into the noble Borghese family of Siena which had recently fled to Rome, thus the reason as to why ROMANUS appears in most of his inscriptions. 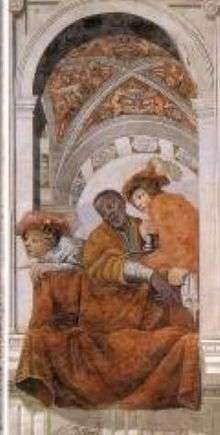 He began his career as a lawyer educated at Perugia and then in Padua. In June 1596 he was made the Cardinal-Priest of Sant'Eusebio and the Cardinal Vicar of Rome by Pope Clement VIII, and had as his secretary Niccolò Alamanni. During this time, he opted for other titular churches like San Crisogono and Santi Giovanni e Paolo. Clement VIII also bestowed upon him episcopal consecration in 1597 after his appointment as Bishop of Jesi, retaining that post until 1599. He also beatified a number of individuals which included Ignatius Loyola (27 July 1609), Philip Neri (11 May 1615), Theresa of Avila (24 April 1614), and Francis Xavier (25 October 1619). Mosaic depicting the arms of Pope Paulus V (Camillo Borghese). 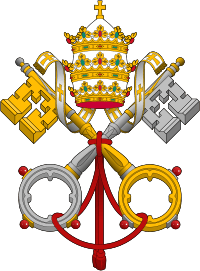 Paul V died on 28 January 1621 of a stroke in the Quirinal Palace and was succeeded as pope by Pope Gregory XV. ↑ Nussbaum, Louis-Frédéric. (2005). "Hasekura Tsunenaga" in Japan Encyclopedia, p. 412. "Paul. The name of five popes. Paul V". New International Encyclopedia. 1905.